Gear up for a career in retail! This 4-week intensive program will teach you the fundamental skills to be a highly successful retail and restaurant attendant. You will graduate equipped for best-in-class customer service. Apply online by finding a program in your area using the tool below. We will get back to you 1-2 days after your application. During this session you will get an opportunity to learn more about Generation and our programs. We will also go over the program requirements, times and dates of class. Generation wants to support you and connect you to resources that will help you focus on learning. We will use this time to learn more about you, also ascertaining that you are the right candidate for the program. This session will provide you with an opportunity to learn more about the training you will be undergoing, with respect to the daily schedule, class rules, what we expect from you and what you can expect from us. We will also go over what you can expect after your training is completed. It is during this session that you get to interact with our trainers, alumni and potential employer partners. Every day, you'll learn new skills to help you advance your career through our intensive and practical training. You will receive a mentor to walk with you the student journey and remain with you after you complete your training. Celebrate your success with family and friends! You will then receive a certificate as you join our ever-growing alumni community. You are also guaranteed an interview opportunity with one of our employer partners within 90 days of training completion. "I completed the program with my perspectives changed, having gained skills to help me succeed in retail." In a world of job training programs, Generation takes a different approach to help you succeed. Generation instructors and mentors get to know each student and are there with resources, tools, and information if a student encounters a barrier. Worldwide, more than 75 million young people are unemployed. But many employers can’t find people with the skills they need for entry-level jobs. Generation is an independent nonprofit founded in 2014 by McKinsey & Company to help bridge this gap—at speed and scale. 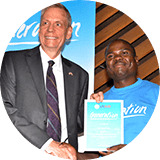 Generation Kenya is a program of Career Readiness Social Initiative.